and your donation will fund collections care. Valley Gives Day is 5.3.16 and our baskets need your help! As we cleaned and re-organized collections storage areas this winter, we brought up more than 120 baskets and mats from a dark corner on open shelves in the Damon House basement at 46 Bridge Street. 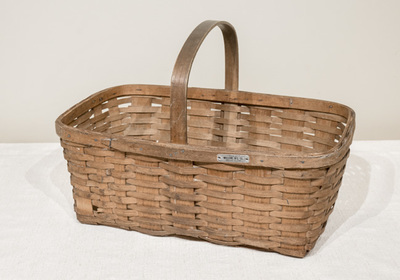 The range is marvelous: pieces made of wicker, pine needle, birch bark, or splits of wood; suitcases, satchels, hampers, yarn, and even a wicker coffin! There is a wastebasket that might have belonged to Calvin Coolidge, baskets by native North Americans, and a wheat-winnowing basket from India that once belonged to Thomas and Edith Shepherd, who lived at 66 Bridge Street. Some items are from the early 1800s; many were made here in the county. 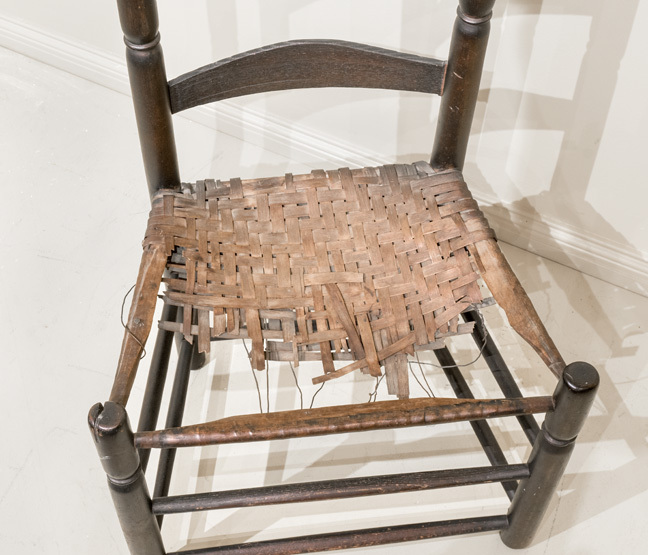 We have a special chair belonging to Sally Maminash, a Native American weaver in Northampton. 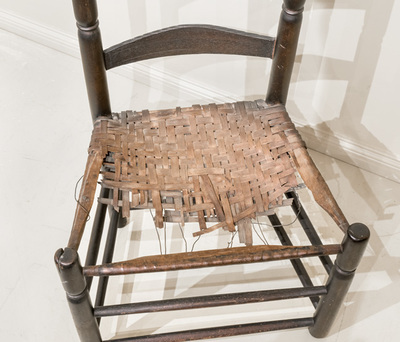 She may have woven the seat herself (shown at left). 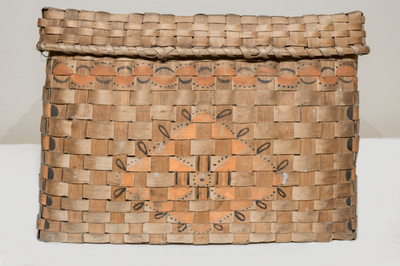 These baskets need cleaning and professional conservation as well as research and documentation. They need archival-quality storage boxes and shelving. This summer we will enlist volunteers to help with the cleaning part. But we need funding to make sure they are stored properly into the future. What is Valley Gives Day? Valley Gives Day is a 24-hour online giving day that takes place on Tuesday, May 3, 2016. It is sponsored by the Community Foundation of Western Massachusetts. Your donation will fund collections care of the basket collection: archival quality storage boxes, professional conservation, research and documentation. Over 350 non-profit organizations participate. The Community Foundation amplifies donations with prizes and golden tickets from sponsors. Together, Valley Gives Day 2014 raised over $2 million for area non-profit organizations. Click on the Donate button to visit Historic Northampton's Valley Gives Day page. Schedule an early donation now or give on 5.3.16. Donations are accepted online by credit card or debit card on Razoo.